The new Advanced Stacker PLUS 18 is our attempt to make processing simpler. One of the things we find we often do is run multiple stacks (Lighten, Darken, Streaks, etc) to determine which effect(s) work the best. Well, we did something for the first time that worked REALLY well, so we will start by sharing that, even though Advanced Stacker PLUS 18 is not yet ready for publication. There are several obvious differences between these images. Because there was strong moonlight (and other light), the sky is over-bright and lacks contrast. 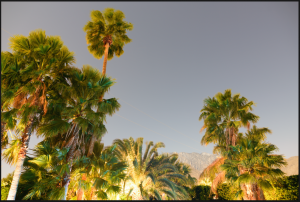 The wind together with surrounding lighting (including flashing red lights from a passing fire truck) caused strange artifacts in the palm trees. Different colored light sources lit the palm trees differently (notice the really cyan colored palm fronds in the second tree from the left). There was utility wiring intruding into the image. Stacker 18 allows you to simultaneously stack in multiple modes. For example, to create this effort I used Lighten, Long Streaks, Darkest, and Average modes. I ended up NOT using Lighten or Average modes in this case. Is there extra overhead keeping more stacks? Yes, there is. However we’ve paired down the stacks to as few frames as possible to keep the overall footprint low. Once the stacking had finished, the result of the Long Streaks was a bit unappetizing due to the red and other artifacts in the trees (see second image). However the Darkest mode stack effectively removes all of the stars – and as it happens, all of the strange highlights in the trees. First we applied a Curves adjustment layer to the Long Streaks and darkened it. 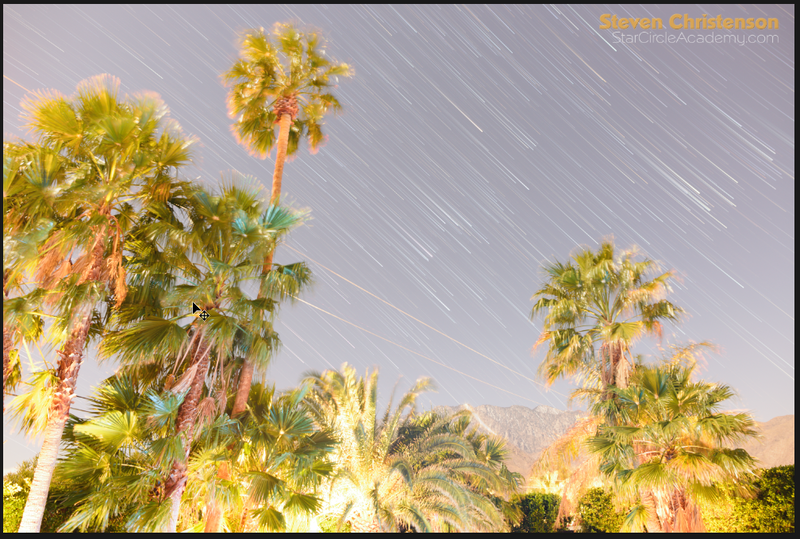 The next operation was to find a way to blend the darkest mode stack (right) with the Long Streaks stack while preserving the star trails and getting the cleaner looking foreground. Duplicate the Darkest mode result (it’s a single layer) on to the Long Streaks stack. Then drag the darkest mode stack to the top layer. Set the new layer blend mode to normal, 100%. Next we need to mask out the sky of the Darkest stack so that the long streaks will show through. 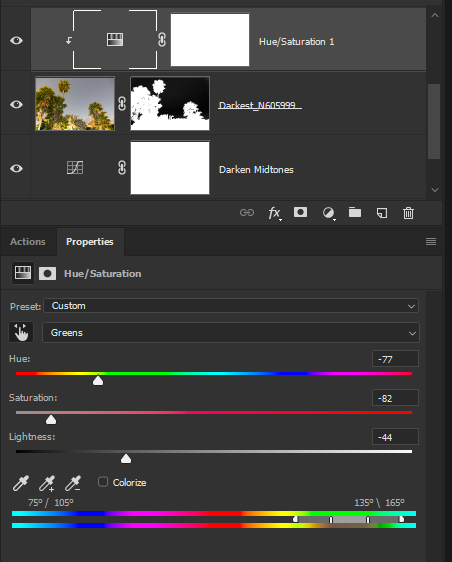 The tool for that is to use Select -> Color Range. Holding down the shift key allows you to click multiple areas of the sky to add to the selection. You can vary the fuzziness of the selection to determine how closely the color has to match the sample. The mask will probably need some manual cleanup afterward, but as you can tell from the selection in the image below, just clicking different areas in the sky produced almost exactly what is desired. After pressing OK you get a selection. The next step is Layer -> Create Layer Mask from Selection -> Hide Selection Once you have a mask, you can paint on it to clean up any artifacts. Adjust the opacity of the darkest layer to make it “look right”. In this example, the combined image looked best at about 93% opacity. 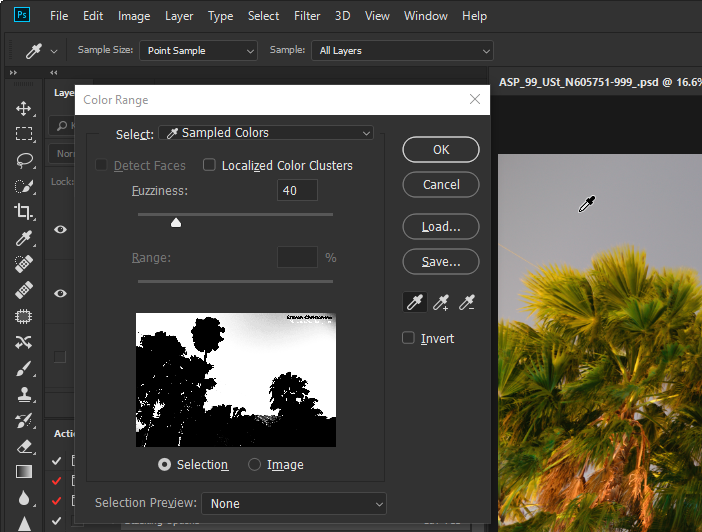 The penultimate step was to create a Hue and Saturation adjustment layer. Lock the adjustment to the Darkest layer (hold the Alt/Option key and click on the boundary between the adjustment and the darkest layer). Then click the “Finger selection” (just below the word Presets). Now there is an eye-dropper which you use to select the color that needs correction. In this case, clicking the dropper on the cyan colored palm frond is the right move. Adjust the saturation slider way down, lightness down, and fiddle with the hue to make the bizarre color more natural. For example you can adjust the spot healing tool brush size to about double the width of the utility line, then click the healing brush tool where the arrows point below. Next work your way outward toward the tree on one side, then the other. Here is a summary of the steps taken – not including the palm frond “naturalization” or spot healing described above. 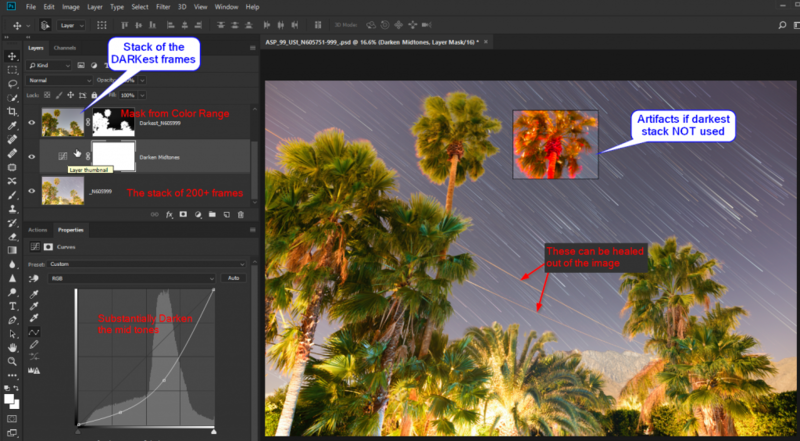 One more trick worth noting… the histogram shown on the Curves adjustment will give you a clue what may need adjustment. Want to know what we consider the top 5 most used photo editing skills? Read here (and part 2 and part 3). This entry was posted in Advanced Stacker, Color Correction, Creativity, Photo Processing, Photoshop, Selections and Masking, Stacking, Star Trails and tagged AdvancedStacker PLUS, color correction, color range, darkest stack, healing brush, hue/saturation adjustment, masking, selection, shift-trick, stacking, star trail, technique on March 15, 2018 by Steven Christenson.